Thinking Spaces: The Improvisation Reading Group and Speaker series runs a reading group session during the academic year every two weeks (currently Fridays 4-6pm). Throughout the year, this group also organizes public talks and workshops. 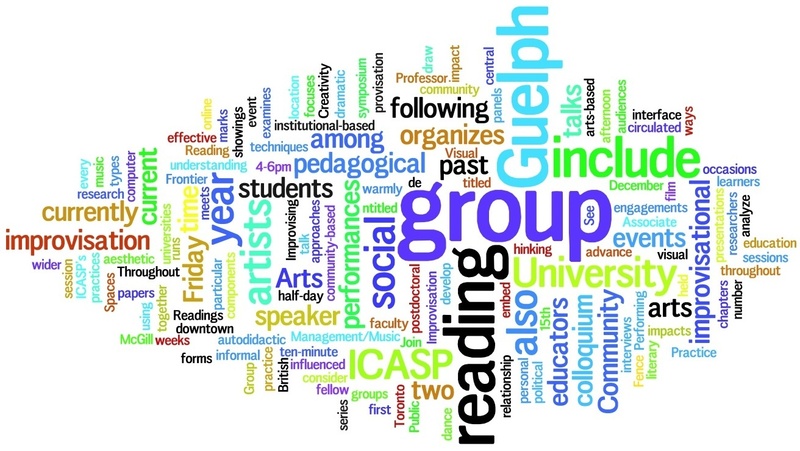 Each reading group focuses on a particular reading circulated in advance, and may also include short informal presentations by current ICASP students, artists or community groups. Readings include articles and chapters, music and performances or other types of “reading”. This group is coordinated by the current ICASP postdoctoral research fellow at the University of Guelph. The group meets at a central location, currently the Guelph Public Library. The group also organizes social occasions following the reading group sessions and speaker events. Join us at any time throughout the year. Community, faculty, students… all welcome! Please join us for Thinking Spaces: The Improvisation Reading Group and Speaker Series on Friday, October 14 from 4-6pm in the 2nd floor board room at the Main Branch of the Guelph Public Library (100 Norfolk Street). The topic of discussion will be “Improvising Capitalism: Shopping and Consumer Choice.” Shopping can be seen as one of the most pervasive improvisatory acts, especially in North America. Faced with a panoply of stores and products, shoppers browse, consider, and maybe do some research. They try on this, have a taste of that, and ultimately make a choice. Moreover, their choices have real impact: they can help transform Starbucks and Cabbage Patch Kids into international commercial forces, while driving Sony Betamax and Eaton’s department stores into ignominy or bankruptcy. In this way, shopping might be read as empowering – a way for everyday people to demonstrate their independence, exercise their freedom of choice, and “vote with their dollars.” In a sense, shopping is akin to improvising on capitalism. But what are the limits to this kind of improvisation? To what extent are shoppers’ choices made for them, a priori? Can consumers negotiate all of the external forces that push their dollars in one way or another and still retain a kernel of improvisatory agency? What about the gendered character of shopping? And what are the political dimensions and implications of the ideas of “freedom of choice,” and “voting with one’s dollars”? Check out yet another positive review, by ICASP postdoctural fellow Sara Villa, of the 2011 Guelph Jazz Festival at All About Jazz. Writer, musician, and teacher Rob Wallace holds a Ph.D. in English Literature from the University of California, Santa Barbara. His research focuses on poetry, improvisation, popular and “world” musics, and the intersections between literature and music. Ben's vielle à roue (aka, the hurdy gurdy) is a contemporary, electro-acoustic instrument with roots in the European middle ages. Through extended techniques, live-looping and processing, Grossman seeks to use it as a physical interface into improvised sound creation, spontaneous composition and the exploration of acoustics, form and extended aesthetics. Ben Grossman is a musician, composer and improviser living in Guelph, Ontario. Having been exposed to a wide variety of music from a young age, he spent his youth building homemade synthesizers, effects and tape loops and playing electric guitar in his parents’ suburban basement and with various groups in various warehouses around Toronto. He worked with composer/instrument creator/educator Barry Prophet, building new acoustic instruments and composing and improvising in experimental percussion projects. Through percussion and his interest in non-equal tuning systems, Ben became involved in the study, performance and recording of traditional Turkish, Arabic, Irish, Balkan, and French music. In 1997 he studied Turkish music in Istanbul and, since taking up the vielle, he has done workshops and lessons with Valentin Clastrier, Matthias Loibner, Maxou Heintzan and Simon Wascher as well as working on Deep Listening and improvisation with Anne Bourne. Ben has over 80 CD credits, and has performed and recorded with many ensembles over the years. The last few years have seen Ben touring with BT and Loreena McKennitt while continuing to work on other projects, developing a solo performance practice and working in improvised, ad-hoc ensembles. He is currently developing a new duo project with video artist/musician Debashis Sinha: field. His first solo album, Macrophone was released in 2007 and features a unique two CD form for simultaneous, aleatoric playback. Improvisation is arguably the most widely distributed form of musical practice – and yet remains the least studied or understood. Indeed, even the boundaries of what is or is not regarded as improvisation remain unclear. This conference will address the many faces of improvisation from a wide range of disciplinary perspectives – historical, psychological, ethnomusicological, analytical, technological, sociological, organological, and pedagogical. Over the course of four days, the conference will include papers, practical sessions, and poster presentations. *Author name(s) with email address, institutional affiliation and postal address for each author. *An anonymised attachment containing a title, abstract (300 words) and five keywords (in Word or pdf format). You should indicate whether the proposal is for a paper, poster presentation or practical session. *All proposals should clearly describe the topic of the presentation and illustrate the aims, research questions and significance of the work. *Papers and practical sessions should be between 20-25 minutes in length. What does a critical examination of diaspora offer to our understanding of popular music in the multicultural settler nation of Canada? Over the past twenty years, the term diaspora has proliferated as a way of making sense of how groups of people, defined through ethnicity, culture, religion, and homeland, have circulated and settled in a postcolonial and increasingly globalized world. Although the history of diaspora is shaped by violence and inequality, the concept has also permitted scholars to move beyond a static sense of a "homeland" or a "multicultural mosaic" and examine the complicated interstices, hybridities, and networks that link populations through travel, communication, memory-and music. The site of this conference, at Acadia University, Nova Scotia, calls to mind many histories of diaspora, colonialism, and the challenging ways in which music, race, identity, and ethnicity can intertwine. Both historically and continuing to the present day, diasporic communities and the indigenous Mi' Kmaq peoples all negotiate their sense of race, ethnicity, and identity in ways that are inseparable from each others' belief systems. * diasporic popular music genres: bhangra, Bollywood, klezmer, etc. * hip-hop and other genres of the "Black Atlantic"
Proposals for single papers, workshops, performances or other forms of presentation may be submitted (proposals for panels should include an abstract of no more than 300 words for the panel as a whole, as well as abstracts of no more than 300 words for each paper proposed for the panel). Please submit your abstract in French or English by October 20, 2011 (for consideration for travel reimbursement) or November 20, 2011 (final deadline for all others) to acadia2012@mcmaster.ca or iaspmca@mcmaster.ca All participants must be members of IASPM-Canada. For questions about the conference, contact program chair, Christina Baade (baadec@mcmaster.ca) or local arrangements chair, Jeff Hennessy (jeff.hennessy@acadiau.ca). *October 20, 2011 (for consideration for travel reimbursement). November 20, 2011 (final deadline for all others). Applicants will be notified of the program committee's final decisions by January 9, 2012.